Challenges - 1st disability magazine in Malaysia! Last time, I attended the 21st International Symposium on Human Factors in Telecommunication (HFT2008), held in Renaissance Kuala Lumpur Hotel, KL because my final project went to be published in a research book! That is why Challenges Magazine editor want to do an article with me about this topic. The disability editors also write many stories and different disabilities; deaf, blind, wheel-chair people, and many.. It is really good to make the readers who can understand what they needs, aware with their community and can support/ help to build many building with the user-friendly, etc! It is very interesting magazine. You can support the disability community in Malaysia, if you interested in buying new magazine from them. A. Where place you can get the Challenges Magazine? B. How to subscribe this magazine? - To subscribe to Challenges, please go to their official website. C. You want to order this magazine from the online bookstore? I hope that it can help you about how to get the issues 12 'Challenges' magazine. If you have any question for me, please leave this comment here. 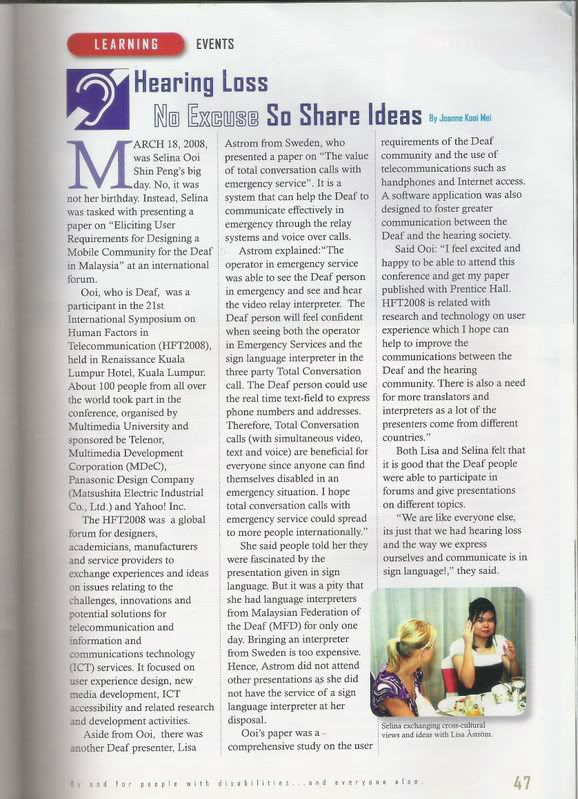 CHALLENGES (the website and print magazine) was initiated to bridge that gap by creating an environment to promote independence, self-esteem and social integration of Malaysians with disabilities within their communities. The first of its kind in Malaysia, CHALLENGES aims to promote positive public awareness on disability issues and inspire with empowering articles.